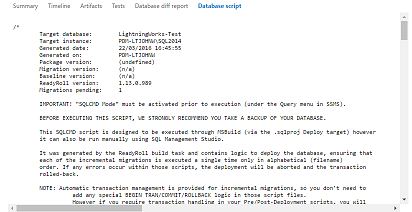 ReadyRoll generates numerically ordered SQL migration scripts that sit inside your Visual Studio project and take your schema from one version to the next. You can add these migration scripts to version control, use them to build and release, and automate database deployments, all in one process. You'll need to use the ReadyRoll Visual Studio extension to create the migration scripts. Get started by following the tutorial. This build definition template is the easiest way to configure a ReadyRoll build. This task downloads the ReadyRoll build components using NuGet, so that you don't have to install them by hand. This task makes it easy to configure the target database that ReadyRoll uses to generate reports. This task will run any tSQLt tests present in a database and output the results as a jUnit compatible file. This extension provides database deployment specific information to your build and release processes. A brief summary of which migration scripts are pending deployment and which objects will be changed. A report previewing the differences between the currently deployment database version and the current build. 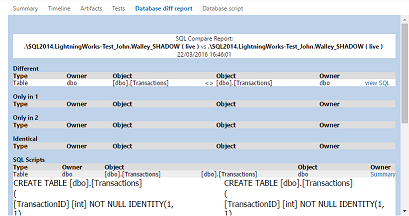 A report previewing the script which will be run against your database. 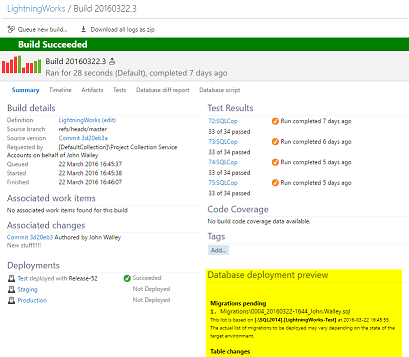 This deploy task will take the package produced by building a ReadyRoll project and deploy it to a target database.